Long regarded as one of Perth’s finest hotels, the Brass Monkey was originally called the Great Western Hotel and was built in 1896 for Mary Ann Davies. Even after her death in 1899 it remained in the Davies family until 1972. The three-storey hotel with its distinctive verandahs was deliberately located to capitalise on the ever-increasing trade coming through Perth Railway Station. After the Fremantle to Guildford line had been completed in 1881, activity moved away from the Swan River and into town next to the station. Designed by well-known architect Michael Cavanagh, for many years, the Great Western Hotel was a favourite place to stay for miners coming off the Goldfields and needing somewhere upmarket close to Perth’s CBD. For decades the hotel changed very slowly, including having all the brickwork painted white at some point. In 1989, the hotel was restored to its 1896 glory and renamed the Brass Monkey. The original colour scheme was reintroduced and concrete floors replaced by more authentic polished timber. Today it remains a popular place for drinks and meals and, of course, is still conveniently located right near Perth Railway Station. The story of the Brass Monkey starts in Aberdeen Street, with the death of the publican Netterville Davies in 1893. His widow, Mary Ann Davies, initially took over the Cosmopolitan Hotel (later the Red Lion Hotel, the Aberdeen Hotel, and now the Games Sports Bar) before she decided to look for a new venue in Northbridge. After the Fremantle to Guildford railway had been completed in 1881, activity shifted from the Swan River to the new railway station. Following the discovery of gold, the population of Western Australia tripled in less than six years, and even more people were coming into town by train. As a result, there was a great deal of building on both William and Barrack Streets. By 1896, Mary Ann Davies had purchased land on the corner of William (then called Hutt) and James Streets, very close to Perth Railway Station. The same year, she commissioned architect Michael Cavanagh to design a three-storey hotel for her. Placing a hotel on the corner of two busy streets was common practice in this era, and the Palace Hotel, the Royal Hotel and the Melbourne Hotel were all on corners. Michael Cavanagh was a good choice of architect. Although he became well-known for designing churches, he also planned the Orient Hotel in Fremantle and the Esplanade Hotel in Perth. 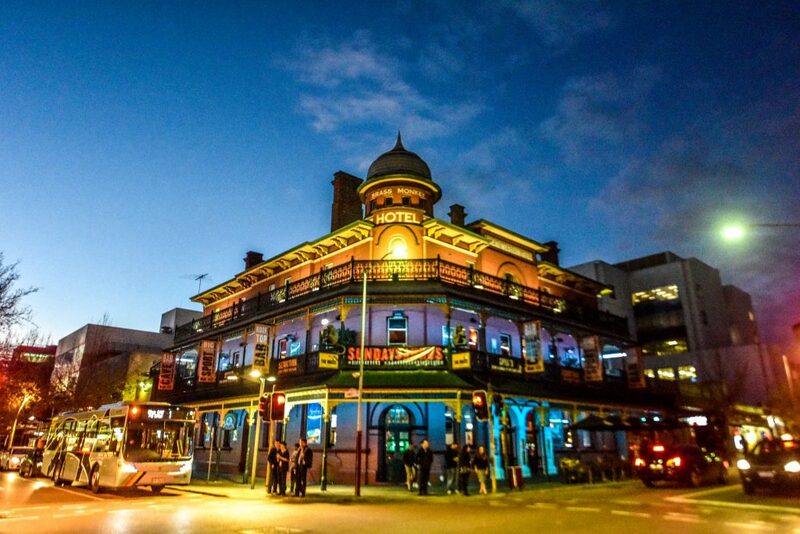 In addition, he converted a former home in Fremantle into the Newcastle Club Hotel (now known as the Newport Hotel). The Great Western Hotel (now called the Brass Monkey) was built for Mrs Davis in 1896, and the first publican was Myer Rosenweig. Three storeys tall, it had public rooms at ground level, with a small cellar beneath, and accommodation for guests and staff on the two upper levels. At the time, it was one of the most lavish hotels constructed in Perth. Although it should be noted that it is remarkably similar to a hotel Cavanagh had designed in South Australia in 1892. It is most advantageously situated, being only one minutes walk from the Railway Station and commanding one of the Best Views of the Metropolis. From the Spacious Promenade Balconies, with which each storey is furnished, can be discerned the blue waters of the Swan, the graceful heights of Mount Eliza, and the fine Public Buildings of the City, all of which make a refreshing picture to the weary eye of the gold-digger, who is tired of sand and monotony. The Bedrooms, each of which is connected with a balcony, are both spacious and well ventilated; the Sitting-rooms comfortable, and the Bathrooms, of which there are a set on each landing, are supplied with Hot and Cold Water. The Great Western Hotel continued to be the premier place for visitors from the Goldfields up until World War II. Following the death of Mary Ann Davies in 1899, the Great Western Hotel continued to be owned by her family until 1972. There was, however, little change to the exterior of the place for many decades. Change came in 1968, when a new bottle shop, a covered walkway to the toilets, and a carport were constructed. At some point, all the brickwork and balconies were painted white, otherwise the outside was little changed from 1896. The interior was also authentic, with public rooms on the ground floor, and accommodation on the first and second floors. After the Great Western Hotel was sold by the Davies family in 1972, it was redecorated and upgraded. Further changes were to follow, including a new two-storey public lounge on James Street, new toilets, upgrading of the saloon bar, and a new games room, which required the removal of the wall between the dining room and the saloon bar. In 1988, the Great Western Hotel was owned by Matilda Bay Brewing Co. Architect Michael Patroni drew up plans for major renovations including the restoration of the buildings original colour scheme, and removal of concrete floors and their replacement with polished timber. On the ground floor, walls were removed to create four spacious bar areas, while the first floor was converted to bars, function rooms, and dining rooms. Original fixtures were retained, and others of a similar period and style were purchased, using salvage materials wherever possible rather than reproductions. After the restoration, the Great Western Hotel was renamed the Brass Monkey after Matilda Bays Brass Monkey stout, and was officially opened on 16 March 1989. Since then, there have been minor alterations, mainly to the James Street addition, including an upgrade of the first floor kitchen, extension of the cool room, and the construction of an elevated walkway linking the Monkey Bar with the external stairs.